Ansite 13 Pcs Auto Trim Removal Tool Set is made of very durable and high quality injection moulded fiberglass nylon, sturdy enough for long-term use while still soft enough to protect the surface of the panel safe from scratches. Great for install or remove car audio/radio, door panel, instrument panel, garnish/trim and upholstery from any car with no damage to the panel or the paint finish. Widely used in: body shops, upholstery shops, marine shops, RV shops, among installers and hobbyists. 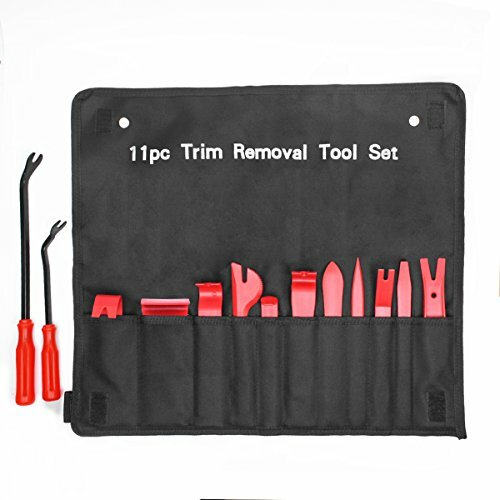 Clip Length: 12.3" & 8.8"
1 x Iron Fastener Remover 12.3"
1 x Iron Fastener Remover 8.8"
High Quality- 11PCS auto trim removal tool made of Nylon Fiber to last long and prevent braking, tougher than common ABS one, it is eco-friendly, non-toxic and breakage-proof. Bonus 2 Clip Removers- Made of iron bar and plastic handle,super HD for easily removing stubborn fastners! Bonus a nylon bag that convenient storage or carry with. Lossless Car Modification- All tools are molded according to car trimming needs on the market, moderate curve that is not sharp, anti-scratches and harmless to car paint in the whole modification. Ergonomic Design- Super lightweight and easy to hold in hand fits hard to reach spaces and crevices. Widely Use- Great for trimming car audio/radio, door panel, instrument panel, garnish/trim etc...A great helper for interior or exterior car trims & even as a bike tire remover. If you have any questions about this product by Ansite, contact us by completing and submitting the form below. If you are looking for a specif part number, please include it with your message.